It is, first of all, a classic case of win-win cooperation. Huawei UK has made an important contribution to the economic and social progress of its host country over the past five years by bringing £2 billion to Britain through investment and procurement and creating 7,500 jobs, making a name for itself as a provider of high-quality products and services. In the process of its cooperation with British partners, the company itself has expanded its global reach and adapted to international standards. Third, Huawei is a supporter of the UK’s future economic growth. 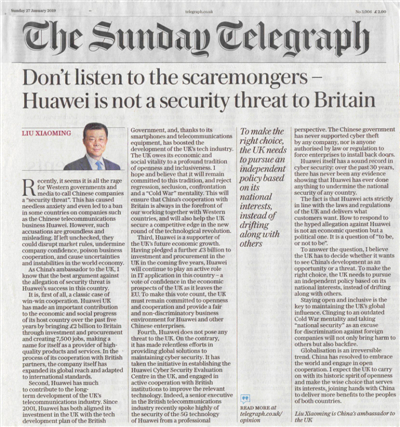 Having pledged a further £3 billion to investment and procurement in the UK in the coming five years, Huawei will continue to play an active role in IT application in this country - a vote of confidence in the economic prospects of the UK as it leaves the EU. 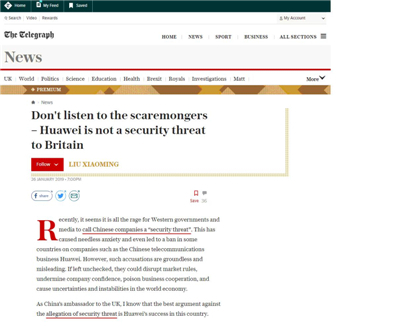 To make this vote count, the UK must remain committed to openness and cooperation and provide a fair and non-discriminatory business environment for Huawei and other Chinese enterprises.